Enjoy these very versatile crepes as such or slather them with a generous heap of your favorite topping to relish a very comforting breakfast. 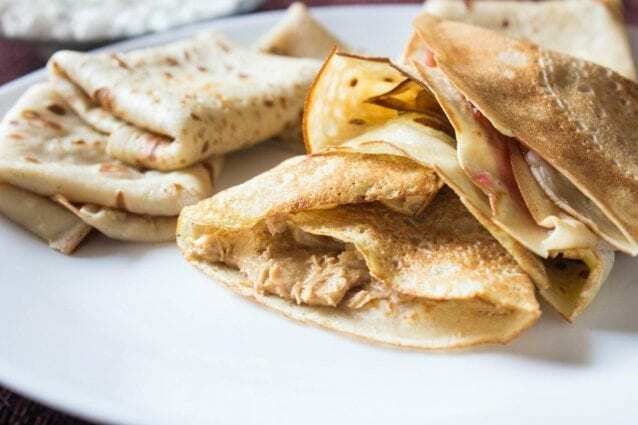 Trust me these very yummy crepes are a huge hit with kids and adults alike!! In a bowl, pour milk and add flour over it. Break the egg into a separate bowl carefully so that you do not put any pieces of egg shell in it. Add the egg over the heap of flour. Add olive oil, baking powder, powdered sugar, and vanilla in to the bowl with a pile of ingredients. Now, gradually whisk all the ingredients in the bowl until the mixture is smooth in consistency and no lumps are present. Heat a non stick pan and brush it lightly with olive oil. Pour a ladleful of the crepe batter at the center of the pan and then rotate the pan to spread the batter in to a very thin layer. Let the crepe cook on low flame for 2 minutes or until the crepe cook at the base. Now, lift the crepe from the edges using a spatula and loosen it around the edges. Use your hands to lift the crepe very carefully and flip it nicely. Cook the other side for another 2 minutes until the crepe cooks on the other side as well. Transfer the cooked crepe to a plate and repeat the same process with the remaining batter. Serve hot crepes as such or spread your preferred topping over it, fold it nicely and enjoy! Move your hand in one direction only while mixing the ingredients. Make sure there are no egg shells present along with the broken whole egg. You may replace vanilla extract with vanilla essence as well in similar quantities. The crepe batter should be thin and runny in consistency. Cook the crepes on low flame and flip them over carefully as the crepes will be very soft and may break very easily. Flip only when the base of the crepe looks partially cooked and the edges of the crepe turn light brown in color. You may add a pinch or a little more salt to the batter as well if desired. How to turn crepes into amazing desserts!